Editor in Chief of Mama Voice magazine. Recognized for her writing on conflict and women’s empowerment, Namwezi N’ibamba proposes to report on why her eastern Congolese province lacks potable water even after donors have poured millions of dollars into local water projects. 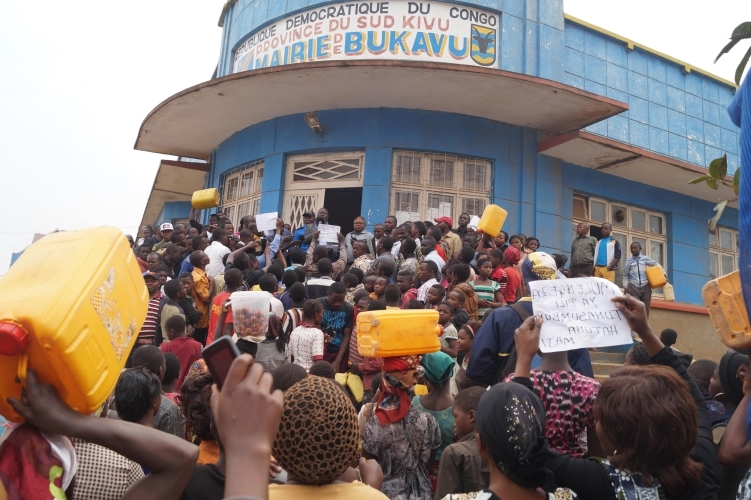 On a Thursday in early September, about 100 frustrated people marched to the City Hall of Bukavu, an eastern city in the Democratic Republic of Congo, to demand the most basic of amenities, a clean-water supply. For decades, they have faced the choice between walking for miles in that dry countryside to fill cans from the nearest body of water or digging deep into the earth to make their own wells. Neither option produces water that is potable, but the wells at least mean women and girls do not have to put themselves at risk of attack by roaming gangs. 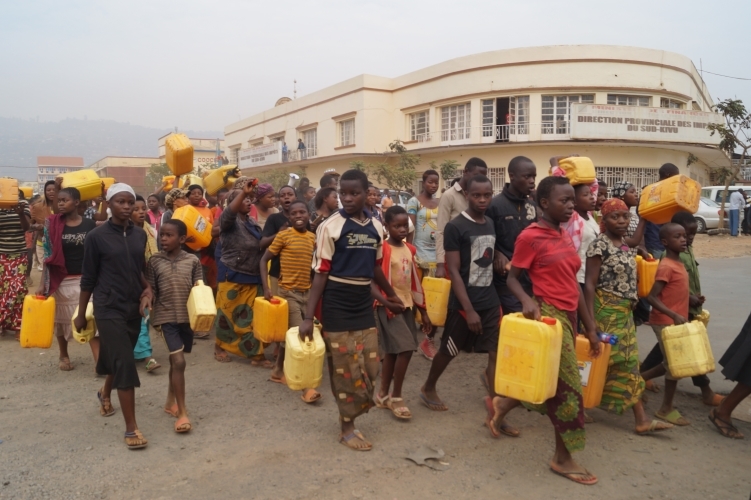 The fundamental issue, as many have been told before, is a population boom in Bukavu fed by people fleeing the country’s long-running war, which has uprooted more than 2 million people and killed 3 million more. At the same time, a regional water official says Bukavu’s water network has not been updated since the colonial era, in the 1940s. The march achieved some modest results: co-organizer Aimé Maroy said water and sanitation officials came to check the local network for the first time since 2006. They found rusted-out pipes, which they promised to repair, but people are still waiting, she said. In my reporting, I have been meeting with local people and with representatives of the national office in charge of water supply. So far, I’ve received little information about the fate of the millions of dollars invested in bringing clean water to South Kivu, the eastern province of which Bukavu is the capital, but I have interviews scheduled with representatives of Mercy Corps, Tearfund, and the International Rescue Committee, all of which have given money for the effort. In the meantime, people here are out of patience. Notorious for sexual violence, eastern Congo's South Kivu province has been called one of the worst places in the world to be a woman. The central African country is also considered one of the most dangerous places to work as a journalist. Douce Namwezi N’ibamba is both. Like most young people in Congo, Namwezi N’ibamba grew up with the terror of a war that has claimed about 5 million lives over decades. The editor in chief of Mama Voice magazine and program director of Mama Radio, Namwezi N’ibamba sees journalism as a way to give voice to the conflict's most vulnerable and to educate Congolese women about their rights. Her interest in journalism dates back to a moment when, at 8 years old, she was listening to the radio with her father. Struck that she was hearing no female voices, she asked her father why all the journalists and guests were men. He responded that very few women wanted to become journalists. Seven years later she was working for a radio station in the provincial capital, Bukavu, that offered journalism training to young people. There Namwezi N’ibamba learned the basics of reporting and produced programs about children's rights issues, including the recruitment of children as soldiers. On turning 18, she joined the Women Media Association, AFEM, in South Kivu, which was set up by a group of women journalists to fight for gender equality. The training and mentoring she received there was formative. “Those women really influenced me a lot," Namwezi N’ibamba says. Along with her focus on gender issues, Namwezi N’ibamba reports on human rights abuses in remote areas of eastern Congo. One assignment took her to Kitchanga, a town where scores of people died three years ago when rebels burned it to the ground. During the attack, thousands of villagers sought refuge at the nearby UN base but were put off as staff in the compound sought approval from their superiors and amid concern that some of those seeking entry could be armed. Since then, many people in Kitchanga – and in other conflict areas where similar incidents occurred – remain skeptical of the UN’s ability to protect them. Two documentaries Namwezi N’ibamba produced on the issue in 2012 were hailed by Congolese human rights organizations. Gender stereotypes and strictures make a tough job tougher. For instance, Namwezi N’ibamba was once banned from entering a mine by a local tribal chief who said the presence of a woman would make its riches disappear – even though many of the mine’s workers were women being paid less than $1 per day. Both male and female journalists face a culture of media repression and censorship in Congo, where the fight for security and survival pushes issues like media freedom to the background. Much of the Congolese press is owned by politicians and well-connected business people who use their media properties to further their own interests. According to the Reporters Without Borders' latest World Press Freedom Index, Congo ranks 152nd of 180 countries. Journalists there are "exposed to threats, physical violence, arrest, prolonged detention, and even murder,” the report says. Even so, Namwezi N’ibamba plans to keep doing what she does best – “I’d love to tell more stories about women’s rights and train local journalists and local communities, so they can tell their own stories themselves,” she says – and she has one project that is particularly close to her heart. Namwezi N’ibamba hopes one day to raise funds to rebuild Kitchanga's burned-out radio station, so people there will once again have access to news and a connection to the outside world. To read about Namwezi N'ibamba's reporting proposal, please click here. Click here to see Douce Namwezi N’ibamba's reporting proposal. 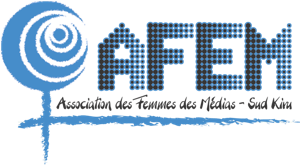 M’Lunjwire Césarine, engagée dans la lutte contre les violences basées sur le genre en territoire de WALUNGU, au Sud Kivu, RDC.